Can there be any doubt now that climate change is affecting the United States dramatically? Its effects are felt strongly in the number and intensity of hurricanes forming in the Atlantic and hitting Texas, Florida, the Caribbean, and Puerto Rico. The number and severity of these hurricanes come about as a result of the warming of sea temperatures. Climate change is also seen in shifts in species populations seen right here in Westford. There have been shifts in several bird species that are probably due to climate change. In the past fifty years, several species of “southern” birds have come north into New England. 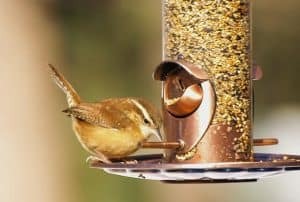 Among these are the Northern Cardinal, the Tufted Titmouse, Northern Mockingbird, and most recently, the Carolina Wren and the Red-bellied Woodpecker. All of these species are still seen in the south, but they have expanded their ranges into New England. This is probably in response to our less severe average winter temperatures. Some birds, such as the American Robin and the Eastern Bluebird, which used to be migratory, are now year-round residents. These species are able to shift their diet from insects and worms in the summer to berries in the winter. These are all native species that are welcome here. But some effects of climate change on species are not so welcome. Some plants have shifted their ranges, though plants are, of course, slower than animals in their responses to climate change. The Sugar Maple tree is the most obvious example of a shift in range. Sugar Maples thrive in cold climates. With our warming climate, they are greatly declining in southern and central New England. They are, in effect, “migrating” north, and it is predicted that in the not-too-distant future, Sugar Maples will no longer be found in the U.S., and the maple syrup industry will be confined to Canada. Many unwanted invasive plants have also expanded north into New England. Among these is Mile-a-minute plant, Kudzu (called “the plant that ate the south”). Westford has instituted a program to try to eliminate Mile-a-minute plant, which has just come into Westford in the past few years. These invasives grow very rapidly, and very quickly overwhelm all other plants in their vicinity. We cannot have a diversity of animals if we do not have a diversity of plants to feed them. Other unwanted species which have invaded the northeast and Westford are insect pests. Very cold winters used to keep these species in check and prevent their march northward. But, with generally warmer winters, pests such as wooly hemlock adelgid and long-horned beetle, are starting to ravage our native trees. What can we do about climate change? Any fix to our problems must be long-term. Primarily, we must reduce our dependence on fossil fuels. Many in Westford are already switching to solar power, either through roof-top solar or through purchasing power through solar farms. Others are opting to buy 100% wind power through their power company. The non-profit Mass Energy offers its New England Greenstart program through National Grid. One can buy a mix of renewables or 100% wind power from Mass Energy. There is a small increased charge for this when you pay your National Grid bill. For us, the 100% wind option cost only $4.82 this past month. Because Mass Energy is a non-profit, these fees are tax-deductible. And, many in Westford are now driving hybrid or all-electric cars, which are much less expensive in gas costs, and reduce greenhouse emissions dramatically. In the long run, these actions will save our climate for our plants, animals and for us. Many thanks to all flora and fauna contributors. Reports should be sent by October 26 for inclusion in next month’s column. You can write me at 10 Chamberlain Rd., call me at 692-3907, or e-mail me at MarianCHarman@verizon.net. Dot Mooney, Monadnock Dr. September 18, eight doves, several goldfinches and house finches a few chickadees in for supper. September 21, at Howard Rd. wetland, a few turtles sun bathing. Under Parkhurst power lines, catbird, towhees, and blue jays, one dove, lots of ragweed and pretty goldenrods, both of which will have seeds to offer birds later. Ground is covered with acorns, a great food source for wildlife. Bittersweet, bright red winterberries, glossy buckthorn, a few pokeweed berries missed by birds and red multi-flora rose hips around. Along the road, grape vines offering bunches of ripening fruit. Another season of plenty for the wild things. September 23, flock of three male and one female turkey in feeder area. September 24, beautiful red-tailed hawk landed in nearby quaking aspen. September 27, a few blue jays out front around feeder, showing how many different calls they can make. September 28, at Howard Rd. wetland, a few turtles. At Beaver Brook, one great blue heron standing in sparkling sunlit water beside the tall reeds, carefully using that long bill to groom himself. On the pond side of the road, a family of mallards swimming in a neat line. Doug Pederson, at Beaver Brook Rd. bridge, September 29, twelve geese, about twenty mallards, two red-tailed hawks, great blue heron. Rosemarie Koester, Providence Rd. September Report: pair of cardinals, one of them balding, goldfinch, house finch pair, pair of blue jays, downy pair, one pecking on our house, red-bellied woodpecker. Saw my last hummingbird mid-September. Tufted titmouse, chickadees, white-breasted nuthatch, red-tailed hawk eating his breakfast on top of our shed. Bear seen, September 3. It tried to take down feeder, no damage, and emptied one goldfinch feeder. Coyote in back yard howling at night. Gray squirrels chasing each other, chipmunks creating holes in lawn, bees on flowers. Honeysuckle climbing on trees and bushes, leaves turning color, poison ivy leaves turning color. Dot Mooney, Monadnock Dr. October 1, small cooper’s hawk cleared all the birds out near feeder. October 4, goldfinches enjoying coneflower seeds and chatting about it. I’ve added a second birdbath to front step and now I often see both being used. Sumac foliage continues to change into more beautiful shades, from green to bright red to maroon. Twelve doves under feeder. October 5, flock of house finches eating seed, males very colorful. Evening, fifteen doves near feeder. One stepped into a birdbath and stayed there stretching his wings and just enjoying his bath for several minutes. Huge full moon beginning to rise over back woods, bright and beautiful. October 17, perfect fall day. Blue jays, cardinals and a few house sparrows around. Three titmice on deck for a visit. October 18, one perky chickadee on deck, a few doves around. Some days there are very few visiting birds. They have so much to feast on now. They’ll be back when the weather turns cold and damp. Are you glad to live in New England in October? Rosemarie Koester, Providence Rd. October 8, great horned owl heard, pair of blue jays, pair of cardinals, one juvenile cardinal, purple finches, chickadees, nuthatch, tufted titmouse, a few doves, a large group of noisy grackles, downy woodpeckers poking in trees and on the house again, a group of seven turkey roaming the neighborhood, chipmunks, three or four gray squirrels, bees gathering nectar. Beth Bonner, Plain Rd. October 10, a bear took down our feeders. Gerry DiBello, Court Rd. October 15, our expensive bird feeder was gone. Later, we found it in the woods nearby. It had been on a rope, high up. The rope ran over a tree branch to a lower point that was reachable. Apparently the bear figured out how to release the rope! Mary Hosford, Groton Rd., October 22, heard a bunch of crows making a big fuss and then saw a bald eagle up in one of the pine trees picking at something it had captured. I got a good video of it flying away.